SAN DIEGO, CA (March 31, 2019) – Following the success of the new hit Boomerang cartoon, IDW Publishing and Cloudco Entertainment are proud to announce an all-new Care Bears comic book and graphic novel program. Expanding upon the imaginative Care Bears: Unlock the Magic streaming series with new story content, IDW will debut its first fun-filled issue in July 2019. Welcome to The Silver Lining in Care Bears #1 – a mystical realm full of mirth and magic! The Care Bears, along with their pals the Whiffles, protect this realm from the negative influence of the mischievous Bluster and his Bad Crowd! With engaging, unique characters and an irreverent and heartwarming sense of humor, this new comic book is perfect for anyone looking for more magic in their lives! 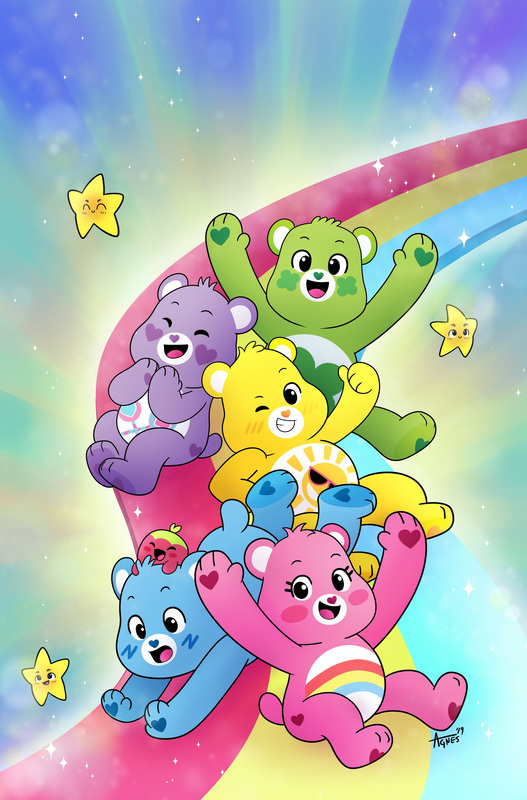 IDW’s Care Bears will be illustrated by all-ages superstar Agnes Garbowska (My Little Pony, DC Super Hero Girls) and feature a story by Matthew Erman and Nadia Shammas. The launch will include a whimsical regular cover by Garbowska and a special variant edition by Tony Fleecs. “I am extremely excited to be working on Care Bears since it was such a huge part of my childhood and impacted me greatly. I hope the series brings the same love and joy to new fans as it did for me,” says Agnes Garbowska. “We’re thrilled to be collaborating with IDW Publishing on a new comic book series that will appeal to Care Bears fans of all ages. Care Bears #1 introduces fresh content to our heritage fans while creating a new and exciting world for young fans to explore,” says Sean Gorman, President, Cloudco Entertainment. IDW is an industry leader in developing comic books for the youth market, proudly bringing reading enjoyment to children of all ages. Their extensive library includes such global brands as Disney’s Tangled, Hasbro’s My Little Pony, Nickelodeon’s Teenage Mutant Ninja Turtles, Scholastic’s Goosebumps, and Sega’s Sonic The Hedgehog. For information on how to secure copies of Care Bears #1, please contact your local comic shop or visit www.comicshoplocator.com to find a store near you.